Swim caps reduce friction, helping to increase speed. Some days, there's nothing worse than going to a hair stylist to get a little pampering and hearing her say, "Honey, your hair is in terrible health" while she pulls at your hair and stares closely at your split ends. 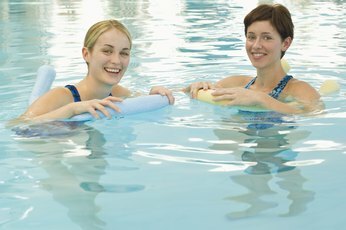 If you're a frequent swimmer, you might opt to wear swim caps because you know the damage that chlorine causes. Olympians and other athletes, however, wear swim caps for a better reason: They'll swim faster in competition. Some people mistakenly think this is an aerodynamics issue, but aerodynamics applies to how things move through the air. The in-water equivalent is called hydrodynamics. Swimmers encounter three types of drag that can slow them down when they're swimming: wave resistance, form resistance and friction. 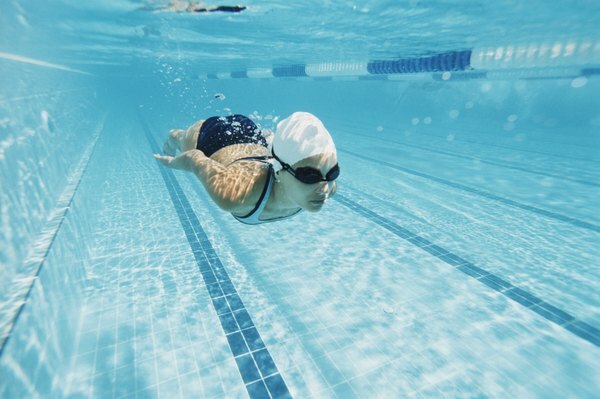 Form resistance originates from how your body is positioned in the water. Turbulence in the water creates wave resistance. Friction is created by how the water moves against the skin and hair. Friction is the least powerful of the three, but it can still slow you down. Swimmers like to wear swim caps because they can help reduce friction resistance. A swim cap fits closely against the head and creates a smooth surface, giving the water little to interaction with your head while you move through the pool. Caps that are made without seams and that create fewer wrinkles are even better at reducing friction. The less friction a swimmer encounters, the faster he'll be able to swim. Latex swim caps don't allow water to permeate through them, so they keep your hair drier. They also fit tightly against your head, which helps reduce the force of drag that can slow you down. The material is less expensive, but it's also thinner and rips more easily. Lycra caps are good at keep your hair back, but the material doesn't do much to reduce drag. Swim caps made of silicone are the thickest, and they are also the sleekest. These caps cost more than other types, but they also reduce drag the best because they form the fewest wrinkles. If your haircut is short and cropped closely against your head, a swim cap won't reduce friction enough to make an appreciable difference in your swim times, unless you're swimming competitively and every second counts. Olympic athletes sometimes choose to wear two swim caps at once. This helps keep swim goggles in place more effectively, but it also combines different materials to more efficiently reduce drag. The cap closest to the body is usually made of latex to fit snugly on your head, while the second cap is typically silicone for better drag reduction. Ryding 2 Health: Does a Swim Cap Make Me Faster? SFGate: Who Do Olympic-Level Swimmers Wear Two Caps?